Her mother Alina Wolfswood is a backer in Dublith. She is 42 years old. Her Father Marco Laken of unknown age left her mother as she got pregnant. Now Alina lives with her new boyfriend, Tobias Shagg (37). They've been a couple for 18 years and don't intend to marry but still pretend to live together until they die. Kassandra's sister Lilian works at the Devil's nest as a waitress, but Kassandra suspects her to have a nasty side-income there. She is nearly 18 and left her parents house tow years ago. Lukas is an old man who deserted from the military after the Ishvalan war. He was a state alchemist and Kassandras teacher after she earned his trust. ::Build: thin, but not skinny. She is stronger than common women and fast. 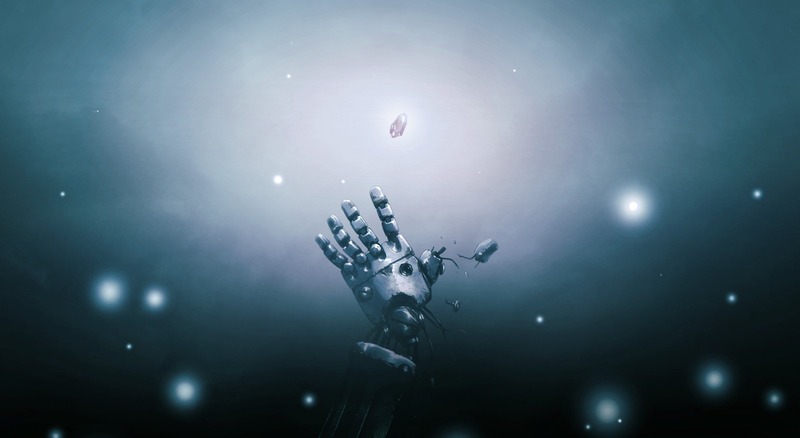 ::Possessions usually found on persona: chalk, white fingerless gloves with flying transmutation circles on the palms, a photography of her family (Alina, Tobias, Kassandra and Lilian), single coins, contact lenses, a notebook and pen. ::Typical Choice of Clothing: her favourite black hoodie, sometimes a white coat with a hood (like the one Roy Mustang wore in Ishvala), gray trousers and a red or yellow t-shirt. Sometimes orange. 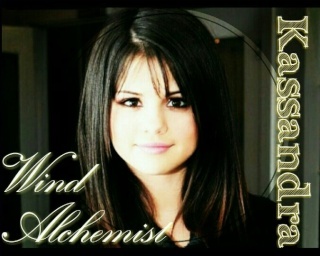 :: Tattoos or scarring: She has a simple wind transmutation circle tattoo on her forehead. Many claim that it is to blow her hair back in a pretty way, but she says it is useful whenever it rains or snows to keep her face from getting wet or cold. It does both. The relationship between Alina and Marco was going pretty well, they had been a couple for more than three years and shared most aspects of their life with each other. Everything turned though as Alina announced that she was pregnant. Marco couldn't take the responsibility and left for good, since he couldn't bare looking into Alinas disappointed eyes ever again. Marco didn't want to raise a kid. It was too much responsibility, more than he had ever taken, and he was fearfull, so he went into a pub at least once a weak and got drunk. As Alinas belly grew bigger, he extended his visits to the pub to two times a week. Later three. Eventually he lost his job (he was doing something for Dublith's government), and since that day he went to the pub every night. At some point he was so drunk that he slept with another woman. He returned to Alina the next day and confessed what he had done, and she treated him coldly afterwards. It happened a second time. As he entered the house the next day, Alina only had to look into his eyes to know that he had done it again. She refused to talk to him and he took his things and left Dublith before the day was over. The first two years many people in the town aided Alina to raise Kassandra, then she met Tobias and got pregnant again soon afterwards. Together they raised both girls. Kassandra was one of the best pupils in her class, while Lilian had neither talent nor motivation for school and used to hang out with sone gangs. They got along, though there was no close relationship between Kassandra and Lilian. That changed when they reached puberty. The guys grew more interested in Kassandra, and since she had grown very pretty, they would try to date her. She usually refused them, though. They also called after her when on the streets. Once she was going through the darker streets. In front of The Devil's Nest, a guy started following her. He approached her as soon as she had gone around a street corner and grasped her arm in a tight grip. He dragged her into a shady alley, though luckily they were not alone there. Coincidentally, Lilian and her gang had paid that alley a visit that night. They saved her and scared that guy away. Kassandra never returned to that part of the city after nightfall alone, and the incident also provoked her getting closer with Lilian. They did more things together and shared some adventures (like being on the river in a paddleboat after midnight, the crazy things that both loved at that age). One day Kassandra was straying through Dublith and encountered a man surrounded by a misterious atmosphere, or so she thought. He avoided other people and hurried into his house. She followed him and rang the doorbell. She was 9 by that time. After a little hesitating, the man opened the door to the child and let her in. He told her that he was an ex-state alchemist, that he had deserted after the Civil War in Ishvala and now lived in a hide with a false identity. He didn't know why he told her, but he had a feeling that he could trust her. Kassandra listened attentive and demanded to see some of his alchemy. So he showed her. The old man went by the name Lukas and taught her alchemy for many years. She would also do his work, like buying his food or cleaning the windows from the outside. It was a payment and distraction for the neighbours at the same time. They surely though that she came to help him out. Alina and Tobias seldomly asked where they went and what they did, maybe it was ro give them freedom, maybe they were too busy whith themselves and enjoyed having time for each other while the girls weren't around. At some point Kassandra told them that she was studying alchemy, and they just nodded and went back to their conversation. She was a dedicated pupil and more curious than most. She wanted to understand everything. When she was 17, the old man told her that there was nothing left that he or his books could teach her (and he denied to even talk about his area of specialization). She would have to move to Central City, so she could access the library if she wanted to learn more. She had a job as a dishwasher in Dublith for a year to save money and once she finished school, she left. By the time Kassandra moved to the heart of Amestris, Central City, Lilian distanced herself even more from her parents. Without Kassandra at home nothing held her back and she went to live with her friends. She works at the devils nest as a waitress and possibly also as a prostitute. Because of that and the distance, Lilian and Kassandra barely keep in touch. They do write each other letters every once in a while, though. Kassandra lives in Central City since two years ago. Her current apartment is better than the first one that she had and the price is affordable. She works in a Bookstore in the afternoon and at a bar on friday and saturday nights to sustain herself and to fund her research. Her progress is slow, though, because she neither has a lot of time nor the resources to study a lot. The library doesn't hold a lot of information on alchemy that is open for the wide public. She had written Lukas a letter about it, and he answered that she should try as hard as she could, become friends with other alchemists and maybe try to become a state alchemist. Though he didn't know how to get money either. Right now this is her biggest problem. Kassandra is a honest, curious and open-minded person. She is fast at understanding things, but also a bit naive and will not mistrust people from the beginning and sometimes sais things she later wishes she didn't. She is just learning to stand on her own feet and is still immature. She has a vivid and explosive personality. She shows her emotions and is relatively easy to be provoked. Sometimes she loses her temper and screams at people. She is very talkative but can be careful if she knows it's important. Lukas taught her not to speak openly about her research. She is impulsive and most likely wont stop to overthink her actions. When she does though she is very creative finding solutions and can be very analytic. Can be. Her goal is to learn as much as possible about how nature and everything works. She hasn't chosen a specialization yet, but wind is very interesting to her. She wants to use alchemy to help people and improve the lives of those who need it. She wants to follow Likas' advice and join the State Alchemists, to get money for her research and wider access to the library. She is against killing people if it can be avoided, but she realizes that the military is also there to protect people. She wants to use her alchemy to protect the nation. That's why she is working hard towards being good enough to join the state alchemists. Kassandra loves reading and is fast. She allways liked to swim and to jump on a trampoline which made it easier for her to learn how to fly. She loves chocolates, cake, cookies and all sorts of sweets. She has trouble remembering names. She is'nt very good at organizing and gets stressed. Kassandra allways trips on the first step on a stairway. When she thinks she twists her hair with her fingers. Kassandra can't lie. If she doesn't want to tell something it is best that she keeps her mouth shut, because she allways blushes when she tells a lie. Kassandra usually practices sports on saturdays, where she goes jogging on a field outwards the city. She also practices her flight abilities and is currently trying to work out how to kick in the air without loosing her balance. She trains her endurance and speed while running, later she will practice basic fighting moves like punchs and kicks. She has never used them against a person, but she is sure that she will be able to defend herself - at least against common street gangsters. Her alchemy is usefull in combat too, because she can blast away enemies and bring them close to her or grab weapons via bringing. How to amplify the control over the wind in order to create a complex shield. 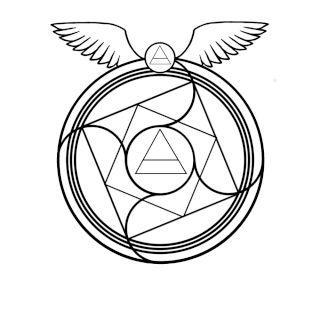 The Simple air transmutation circle is tattooed on her front and the two Flying arrays are on her gloves. Depending on the orientation of the spiral it makes the wind go towards the circle or away from it, which allows it to move the object if it is small. Like the first one that was shown to be used by the Elric brothers, this very basic ability allows to transmute earth and other materials into any physical form of choosing. Makes it rain on and around the circle by separating the water from the air. Creates sparks as long as it is being activated. Since the sparks go out if they don't provoke an object catching fire because the oxigen in the air is still mixed with nitrogen, the reaction is endothermic and therefore needs new energy constantly in order to keep working. 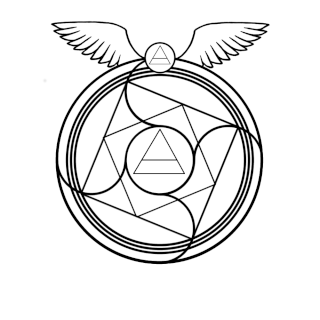 By activating only the wind transmutation circle on her right hand with the runes of power and control on fingers of her left hand, Kassandra can create a suction strong enough to bring objects and people to fly towards her over a medium distance. By clapping her hands together, Kassandra can activate the transmutation circles on both hands and fly, while one array controls the wind that pushes her up and the other one the one that pulls her. 1)Fill me in a little on why her parents broke up. Add a little detail in there about what her mother was so disappointed about that she couldn't be with Marco anymore? 3)A little more detail on the section where Kassandra is going to meet her new alchemy teacher.. Since he's in hiding is she meeting him there secretly all the time, or do her parents approve of her learning alchemy? Or do they not even know that she's learning alchemy? :0 *gasp*! Is she pretending to be a delivery person there on days that she goes, so that people think she's just doing a part time job and helping the man out, or is there the possibility she could be seeen and her parents might get mad at her and forbid her from going to learn from him anymore? Are her parents okay with alchemy in general? or are they distrusting of it? Research is expensive to fund, which is why the State Military alchemists are so well off and progress further in their abilities. THey have pretty much limitless resources and freedoms on their hands to conduct their work. Also, not being able to conduct all the research she'd like to be doing is probably a frustration to her, unless she has some other way to source resources. is here teacher still alive? if he's helping her continue her research, how is he getting the resources/ money to continue conducting all this research? 5)In the alchemy abilities, i think overall, everything looks really good :)Again i love the xmute circles! I think you could have her consider another ability instead of "light healing" because life energy is not really explored until later in alchemical studies. It's a very advanced principle and requires different material/ mechanics and knowledge (more on a medical basis) than just manipulating soils and stone or water. You could consider an ability for her something along the lines of 'projectiles' being able to pick up and aim objects to shoot them as a projectile like wiht a gun, but without the weapon in hand. That could be one of her higher abilities as a B Class alchemist. Also I like her wind shield she's working on that's gonna be awesome! On a similar note, while I'm thinking of it: just remember that if she activates her abilities like to keep herself from getting wet or snowed on or something, and sustains the ability for long, it takes a lot of concentration and eventually will sap her mental stamina because of the focus she'd have to dedicate to sustaining the ongoing transmutation of blowing wind. [Aaand lastly, could you please re-size your profile img to be more narrow? I love it, but it's huuuge! lol Closer to 250-300 pixels in height. It will still be legible, even with the text on it. Kassandra's military ID once she's joined, will be the following, unless you have another ID you'd rather assign her. Approved for use for RP , but for new alchemy abilities, you'll need to pass them by me real fast before adding to the bio. yay! i can't wait for Kade and Kass to meet!! we need to start a thread for them. You have any specific ideas on how you want them to run across one another? Kade can eventually start suggesting she take the state alchemy exams.